GO CHILDREACH! We did it! 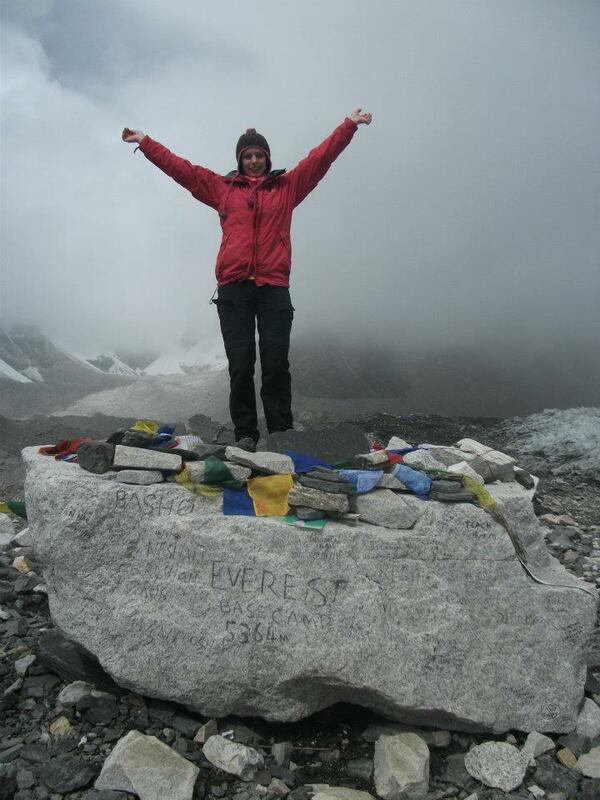 Celebrating at EVEREST BASE CAMP! 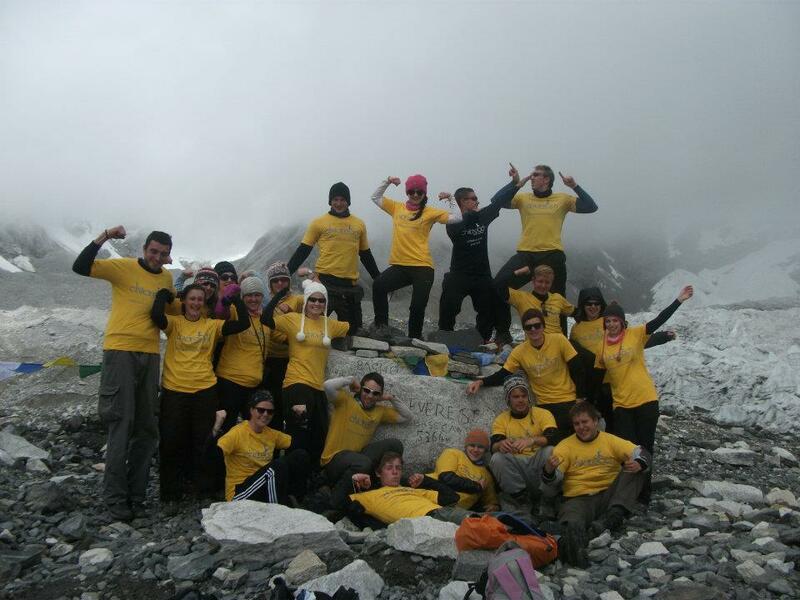 A group of 21 students from The University of Sheffield, including myself, reached Everest Base Camp, all proudly wearing our fetching yellow Childreach International t-shirts, the charity we had raised more than £40k for. It was possibly the most demanding challenge, both physically and mentally, I have ever experienced. There were times when you were so cold you thought why am I doing this, times when all you wanted was a pizza or some sausages (which was well documented in my diary!) but had to make do with plain rice and there was even a face swelling incident which made any happy trekking pictures almost impossible. That said, it was the most amazing experience of my life and I can hand on heart say that the downs were worth the spectacular highs and that overwhelmingly feeling when we finally reached base camp after a gruelling 12 day trek. The highs didn’t stop after reaching base camp either. The following day, still giddy, albeit a bit tired and groggy from our achievement, we were woken up in the early hours of the morning to climb Kala Patthar at an impressive 5,545m. It was definitely head torches at the ready as we scrambled over rocks and all I could think about was taking in those panoramic views of Everest and trying to demolish my frozen Mars bar at the top – but it was so worth it (the views and the experience more than the Mars bar I mean!). After the trek we had some time off to explore Kathmandu. I fell in love with it and it became my second favourite place I have been lucky enough to see so far – sorry but Australia just pips it to the post. Since then my desire to travel and explore has continued to bubble away. This year I have finally found an outlet for it. I’ve taken on an even bigger challenge of climbing Kilimanjaro at 5,895m high, the highest free-standing mountain in the world. Once again I am taking on this challenge for Childreach International, an amazing and extremely worthwhile cause dedicated to providing children in poorly developed countries with the same opportunities any other child would have. Whilst in Tanzania (I fly out on August 25 EEK!) I will spend some time working on a Childreach project to witness first-hand the amazing work they do and what a difference the money I raise will make. I truly cannot wait. Those who know me will know that if I’m going to do something, I want to do it right, so my training is already in full swing and I’ve got lots of ideas for my fundraising. With a fundraising target of £2,650, slightly higher than it was for Everest, I will be giving it my all. Braving the snow and freezing cold temperatures in just our underwear to raise money in a street collection. We raised so much money in just one (albeit very cold) day thanks to the generous people of Sheffield. I’ll be taking on various random challenges for my fundraising – first up is a street collection and I want to know what fancy dress costume YOU think I should do it in. Submit your ideas using the form at the bottom of this post.